Gordon Wagener has changed the design philosophy of Mercedes. When it comes to design, Mercedes-Benz was long the conservative grande dame of luxury-car makers. Styling was understated and aimed at middle-aged buyers. But a shift toward sportier and more youthful styling, partly driven by U.S. executives, has been paying off. 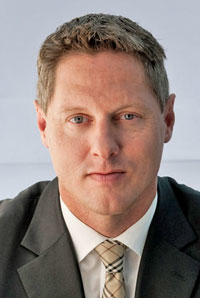 Mercedes has changed design philosophy under Gordon Wagener, who led the brand's advanced studio before being named chief designer in mid-2008. The transformation actually started with the new-generation C class, which debuted in the United States in 2007. It continued with a new E class and E-class coupe in 2009 and the sleek, two-door SLS sports car in May. A redesigned CLS four-door with coupe styling will go on sale next summer. The new cars have been hits in the United States. Sales are up, and so are conquest sales and brand loyalty rates. According to R.L. Polk, Mercedes loyalty increased from 52 percent in 2008 to 56 percent this year, while BMW loyalty fell from just over 51 percent in 2008 to a shade under 50 percent in 2010. Mercedes also is attracting younger customers. The median age of buyers has dropped to 51, from 54 three years ago. For years, more aggressive styling had been high on the wish list of Mercedes' U.S. executives. They had long stressed that American buyers want sportier-looking cars, said Stephen Cannon, vice president of marketing at Mercedes-Benz USA. "We are so thrilled at what's coming out of the design department," he said. "It is consistent with what we've been asking for." The design changes mark a clear shift in philosophy under Wagener, said Klaus Frenzel, senior manager for exterior design at Mercedes-Benz in Stuttgart. "Were getting more sporty and much younger," he said. "That is our guiding theme." It is a sign that the U.S. market has become more influential inside the German company. Cannon said Mercedes-Benz USA executives are being shown vehicles well before the final design decision is made "so we can sound off and give an opinion." In the past, the U.S. team got to see vehicles shortly before the design freeze, so major changes weren't possible. In addition, every new product now comes to the United States for consumer clinics. "There is a strong commitment," said Cannon. "We have early designs and show them to real customers. We do it in California, where people are so car-centric and where the car IQ is so high." The new design direction began in 2007 with the wider, lower C class. "It has very dynamic lines down to the road," said Frenzel. "The side shows power around the wheels, and it has a coupe-like silhouette." The Sport version is even bolder. Rather than the traditional, center-mounted three-point star on the hood, the Mercedes star is integrated into the grille -- an element that dates back to the legendary 300 SL gullwing of the 1950s. Cannon said the Sport version now accounts for 90 percent of the car's sales and is bringing in new buyers. According to R.L. Polk, 56 percent of all C-class sales are now conquest, compared with 51 percent for the previous generation. A coupe version of the C class that debuts next year "is a bold, strong step," Cannon said. And he said the next-generation C class, due in 2013, will stay on the same path. "I feel like the design department in Stuttgart is swinging for the fences," Cannon said. The E-class coupe: Conservative, it's not. The redesigned E class was the second range of vehicles to get a style overhaul. Frenzel said the biggest change was the front end, which got square lights instead of the four round eyes. "The lines are more concrete and dynamic," he said. "The surfaces show the precision of the car." In the United States, the E class is leading the mid-range luxury sedan segment. Sales through October are up 53 percent to 50,298 vehicles. BMW's 5 series, the runner-up, is down 10 percent to 29,401 over the same period. But sales slipped because the redesigned 5 series went on sale in May. Frenzel said that in the future, "you should still recognize every Mercedes-Benz as a brand member of the family." But he said plans call for giving Mercedes models an increasingly individualized look. That's good news for Mercedes' U.S. sales arm. "What's refreshing is the new stuff as I look forward at what is coming out of the design department," said Cannon. "We finally have a simpatico department that is delivering what we want."